It has a bright green color towards the root area and as it goes up to a point is changes to a reddish brown color. It is not very spiky as much as it is prickly there are a couple of scars just from treatment in the store I imagine. I set it by a window all day I don't really know how much sunlight it gets I imagine no less then 8 hours and I "water" it every day just by spraying the soil around it with a light spray bottle not so that the dirt is wet but just so that it is not completely dry and so far it seems to be doing pretty well. But I was inspecting it to see how it was doing and the "leaves" felt soft which I thought was from overwatering so I didn't know if it was suppose to feel like that or if it wasn't how I could fix it. 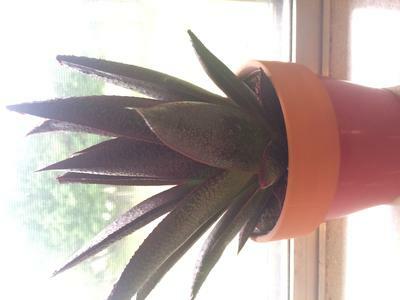 I don't know what kind of plant it is because the price tag had the name on it and since it was a gift they took that part off. This is one of my absolute bug bears - something I hate to see. This plant has been painted, it looks like. So, generally, succulents don't like too much water - this includes spraying the soil surface. Stop it! This will kill it for certain, even if the paint doesn't. Just put it on ignore for a while, no watering, no messing with it, let it recover and try to get rid of the paint naturally, by growing out of it. 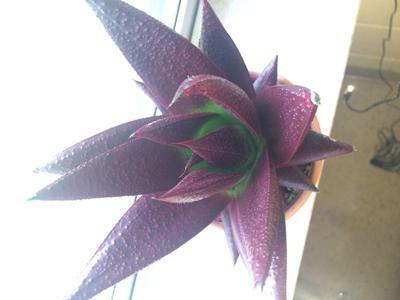 This looks like some kind of Haworthia. See more about them here; Haworthia. As it happens, Haworthia don't really like too much sun, so if you have a window with slightly less intense light it will do better (or just put it away from the window a bit).